Totally unrelated to tektites, but rocks in the desert are heated in the day time and cool at night. So, they go through a heating/cooling process as a tektite might be exposed to (but on a considerably different timescale and at considerably different temperatures) during re-entry. Secondly ventifacts, as the name implies, are exposed to wind. 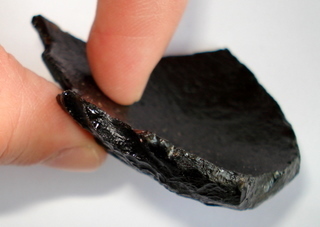 Tektites were also exposed to air moving around the body during re-entry. The main things I want to be communicated here are that apparently oriented grooves are formed, increasing in number on the sides. 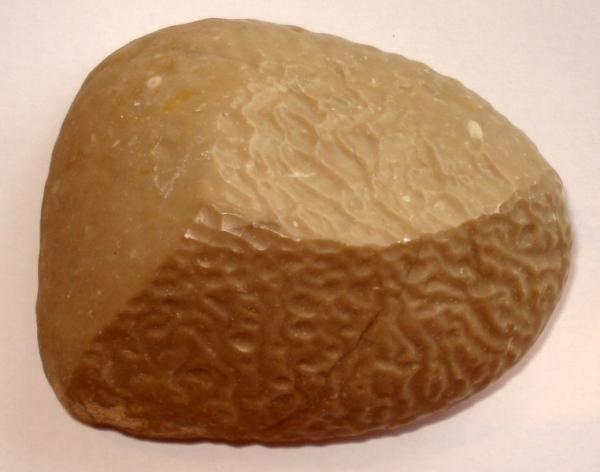 The rock shown below is not a million miles away from a moldavite or Anda tektite. I'm not saying a moldavite sat in a desert and it almost certainly did not weather in the same way. Maybe something can be taken home from this rock about heating/cooling and development of cracks, which are then abraded out by wind blown sand. Ventifacts are typically found in desert regions where the rocks have been exposed to sand blasting for a considerable period of time. The classic three sided ventifact is known as a 'Dreikanter'. ABOVE: A ventifact from the Empty Quarter in Oman. It shows apparent orientation, but it isn't. The reverse of the specimen is very similar. ABOVE: A classic three sided ventifact (dreikanter) from the Empty Quarter in Oman. LEFT: Igneous rocks transported from the Precambrian shield of the Kingdom of Saudi Arabia. Foung in the Hofuf River Beds in Qatar. On one side these stones are smooth, but on the exposed side polygonal cracks have formed, presumably in response to heating and cooling by the desert sun. Stones that are exposed to changes in temperature can undergo thermal stress weathering. This may be of interest to tektite researchers as tektites are also exposed to thermal stresses during re-entry. Onion skin weathering or exfoliation commonly takes place in the desert where there is a large difference in temperature between the day and night. The rock heats up and expands in the day and then contracts as it cools at night. This exerts stress, resulting in the outer layers of the rock peeling off. Some good examples can be found by doing a google image search. The result, however, is not too disimilar from Indochinite shells. Philippinites also appeared to go through the same process and Australite cores have lost a stress shell. Thermal shock, which has been encountered by tektites during atmospheric passage, is not too dissimilar from this process of weathering. LEFT: An Indochinite shell, possibly formed by thermal shock, or perhaps just representing a bubble. Note that the convex side is scupltured, whilst the concave side is smooth. This is always the case.